Dustin Beruta of Cashion’s Eat Place created a yummy vanilla Rickey. Sunday was a perfect day to stand alongside a bar on a roof and drink a refreshing beverage, maybe something a little sweet, maybe something a little fruity. 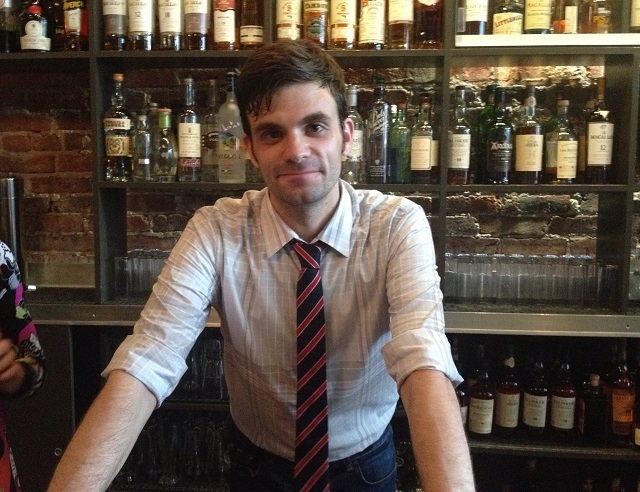 Seven of the top bartenders in the city were happy to oblige as they faced off under the auspices of the DC Craft Bartenders Guild for the title of best Rickey at the Jack Rose Dining Saloon in Adams Morgan. The seven Rickeys came in a variety of mixtures, and included recipes made from gin, bourbon or rye. The arrangement for the 2014 contest was simple and effective. Three bartenders with gin-based Rickeys served their creations upstairs at Jack Rose, while the whiskey-based Rickeys were served by their mixologists downstairs. A reasonable $35 provided unlimited access to all seven Rickeys, allowing the audience ample opportunity to judge their own personal favorite from among the competitors. The judging panel for the Rickey competition awarded best Rickey to the gin-based “Supafly Rickey,” created by Lukas B. Smith of Daikaya. It consisted of Half Moon Orchard Gin, cured sweet potato soda and a drop of rose water, garnished with a lime and a spray of lemongrass. It was pretty damn easy to drink, and it was probably the freshest and most memorable beverage among an excellent lot. The bartenders ran out of the ingredients for the Supafly Rickey well before the conclusion of the four-hour event. Daikaya vows to display the Best Rickey Trophy at the bar for the next year, and perhaps they will continue to serve their winning cocktail as well. Downstairs, to my pleasant surprise, were an outstanding roster of whiskey-based Rickey drinks, including one that attempted to give Daikaya a run for its Asian-themed money. 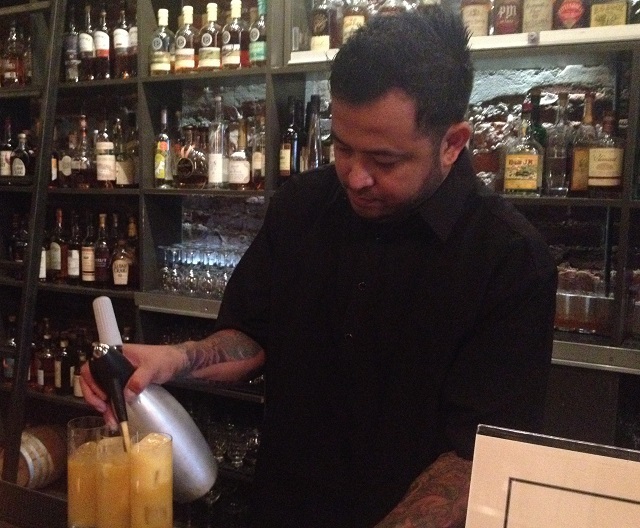 Jo-Jo Valenzuela of the Sixth Engine developed the “Asian Wickey” with Knob Creek Bourbon, lime and spiced mango soda. The gregarious Valenzuela explained how the ingredients were inspired by his native Philippines, and it was a very pleasant concoction indeed. 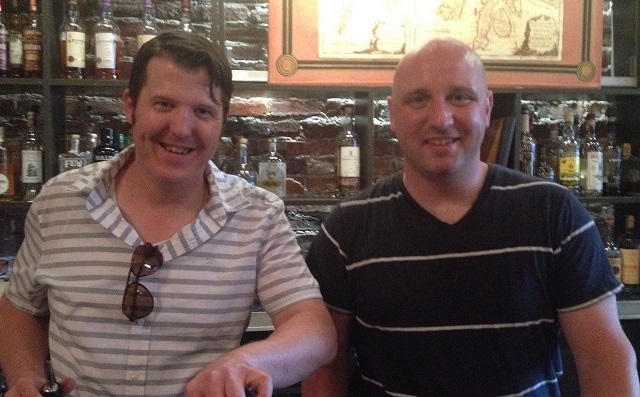 Dustin Beruta of Cashion’s Eat Place offered a Florida-inspired Vanilla-Key Rickeym while Brian Nixon of Rose’s Luxury created a tropical Rickey #7, which has been available to order at the Barracks Row restaurant. Brian Nixon, left, of Rose’s Luxury mixed a tropical Rickey #7. An unusual but lovely Yabba Dabba DoRickey, offered by Eve Maier of Hank’s Oyster Bar, consisted of Knob Creek Rye, raspberry basil syrup, key lime, Thai bitters and Anderson Valley Gose. I certainly was not expecting beer to be an ingredient of any of these cocktails, but the tart wheat beer (The Kimmie, The Yink and The Holy Gose by Anderson Valley Brewing Company) was a perfect addition to a crisp summertime cocktail. The competition was the culmination of what the DC Craft Bartenders Guild terms “Rickey Month” in July, where more than 50 bartenders competed for consideration as best Rickey. For purposes of the competition, all Rickeys were required to include Half Moon gin, Knob Creek Bourbon or Knob Creek Rye, lime juice and sparkling water or soda over ice.